In the United States, the term constitutional carry, also called permitless carry, unrestricted carry, or Vermont carry, refers to the legal carrying of a handgun, either openly or concealed, without a license or permit. The phrase does not typically refer to the unrestricted carrying of a long gun, a knife, or other weapons. The scope and applicability of constitutional carry may vary by state. The phrase "constitutional carry" reflects the view that the Second Amendment to the U.S. Constitution does not abide restrictions on gun rights, including the right to carry or "bear" arms. The U.S. Supreme Court (SCOTUS) had never extensively interpreted the Second Amendment until the landmark case District of Columbia v. Heller in 2008. Prior to this, a tapestry of different and sometimes conflicting laws about carrying firearms developed across the nation. In deciding the case, the court found that self-defense was a "...central component of the 2nd Amendment" and D.C.'s handgun ban was invalidated. The court further suggested that some state or local gun controls may be allowed. The Heller case was extended by SCOTUS in the 2010 decision McDonald v. Chicago, which held that the 2nd and 14th amendments to the U.S. constitution were "fully incorporated" and thus the right to "...keep and bear arms applies to the states and not 'in a watered-down version' but 'fully applicable'...," and limits state and local governments in passing laws that restrict this "individual" and "fundamental" right to "...keep and bear arms," for self-defense. All of the state laws described below operate in the context of federal regulation regarding the transfer and sale of firearms. Firearms and ammunition are subject to taxation as well. As of March 11, 2019[update], Alaska, Arizona, Arkansas, Idaho (residents only), Kansas, Kentucky (effective June 26, 2019), Maine, Mississippi, Missouri, New Hampshire, North Dakota (residents only; concealed carry only), Oklahoma (effective Nov. 1, 2019), South Dakota (effective July 1, 2019), Vermont, West Virginia and Wyoming (residents only) do not require a permit to carry a loaded concealed firearm for any person of age who is not prohibited from owning a firearm. Permitless carry in Idaho, North Dakota and Wyoming is applicable to residents only; non-residents must have a permit to carry a concealed handgun in these states. All aforementioned jurisdictions do not require a permit to openly carry either except for North Dakota and certain localities in Missouri. On July 24, 2014, Washington D.C. became a permitless carry jurisdiction for a few days when its ban on carrying a handgun was ruled unconstitutional and the ruling was not stayed. The ruling said that any resident who had a legally registered handgun could carry it without a permit and non-residents without felony convictions could carry as well. The ruling was then stayed on July 29, 2014. In June 2015, following victory in a class-action suit brought by "Damas de la Segunda Enmienda" Ladies of the Second Amendment (an affiliate of the Second Amendment Foundation) the Commonwealth of Puerto Rico's carry and licensing regulations were struck down, eliminating the requirement to obtain a permit. On October 31, 2016, The Supreme Court of Puerto Rico denied a motion for reconsideration of a previous Court of Appeals decision that had found the Weapons Act to be constitutional. On June 11, 2003, Alaska governor Frank Murkowski signed House Bill 102 into law, making Alaska the first state to rescind its requirement for a concealed carry permit. The bill eliminated the crime of simply carrying a concealed weapon by changing the definition of the crime. The section of law that describes the first instance of "misconduct involving weapons in the 5th degree" now requires that a person must either fail to inform a law enforcement officer of the weapon upon contact, fail to allow the law enforcement officer to secure the weapon (or to properly secure the weapon him/herself) upon contact, or if at another person's home, fail to obtain permission from a resident to have a concealed weapon on the premises. No permit is required to open carry or concealed carry for both residents and non residents. Open carry is 18+ and concealed carry is 21+. The law took effect on September 9, 2003. On April 16, 2010, Arizona governor Jan Brewer signed Senate Bill 1108 into law. The law eliminated the requirement to obtain a permit in order to carry a concealed weapon in Arizona for U.S. citizens or residents 21 and older. The process to obtain a permit was left in place so that Arizona residents could still obtain permits in order to carry concealed in other states or to carry in a restaurant or bar that serves alcohol. This extends to both Arizona residents and non residents with no permit required to open carry at 18 and none required to concealed carry 21 and up. The law took effect on July 29, 2010. Prior to August 16, 2013, Arkansas law (§ 5-73-120) prohibited "...carrying a weapon...with a purpose to employ the handgun, knife, or club as a weapon against a person." Among other exceptions, Arkansas law allowed a defense to the charge of carrying of a weapon if "[t]he person is on a journey..." but did not define what constituted a "journey". Another defense permitted an individual to carry a concealed weapon if the person had a valid concealed weapons license. This provision was generally interpreted to prohibit open carry. On August 16, 2013, Arkansas enacted Act 746. This act made two major changes. First, it statutorily defined a "journey" as "...travel beyond the county in which a person lives..." Because traveling on a journey is one of the defenses to § 5-73-120, a plain reading of the statute would indicate that the prohibition against carrying a weapon would now apply only to a person traveling within their home county. Second, it modified § 5-73-120 to prohibit "...carrying a weapon...with a purpose to attempt to unlawfully employ the handgun, knife, or club as a weapon against a person." Various firearms groups interpreted this provision to require that the state must now prove that a person actually intends to use a weapon to commit a crime; and without proving this intent, possession of weapons, whether openly or concealed, is now legal. However, some confusion still existed. On July 8, 2013, Arkansas Attorney General Dustin McDaniel issued an opinion stating that Act 746 did not authorize open carry. On August 18, 2015, Arkansas Attorney General Leslie Rutledge issued a different opinion, saying that open carry of a weapon following Act 746's passage is now generally legal, provided that the person has no intent to unlawfully employ said weapon. Rutledge also opined that, while mere possession of a loaded handgun was formerly sufficient to establish "intent to employ" it as a weapon, such possession is now no longer sufficient to convict someone under § 5-73-120. Rather, the state must now additionally prove intent to unlawfully use the weapon. However, Rutledge also opined that concealed carry generally remains illegal without a permit. Because Act 746 did not remove or modify the other sections of Arkansas law pertaining to issuing concealed weapons permits, she concluded that possession of a concealed weapon without a permit could be construed as meeting the "unlawful purpose" requirement. However, various firearms groups disputed this opinion and argued that, because § 5-73-120 (and specifically subsection (a)) permits unlicensed open carry, the same legal logic would dictate that concealed carry without permit would also be legal. Further adding to the confusion was the fact that Act 746 changed the list of § 5-73-120 exceptions, including possession while on a journey and possession of a concealed handgun with a concealed handgun permit, from a list of "affirmative defenses" to a list of "permissible circumstances". Rutledge noted in her opinion that such change could be construed as creating a "non-exhaustive list of circumstances under which it is permissible to carry a handgun", thereby permitting a person to assert additional circumstances not spelled out in the statute. She also noted that future legislation would be the best solution to clear up the confusion that Act 746 has caused. On October 17, 2018, the Arkansas Court of Appeals issued a ruling that clarified that the mere carrying of a handgun is not a crime by itself absent a purpose to attempt to unlawfully employ the handgun as a weapon against a person, and any ambiguity would be found in favor of the defendant per the rule of lenity. This effectively ends the dispute on the legality of permitless carry in Arkansas and allows for the unlicensed open carry and concealed carry of a weapon. Governor Butch Otter signed SB 1389 on March 25, 2016. The bill went into effect on July 1, 2016. SB 1389 does not apply to residents of other states. Non-residents must openly carry, carry outside city limits, or have a permit from any other US jurisdiction. SB 1389 also created an avenue for individuals 18–20 years old to obtain concealed carry permits. Originally permitless carry applied to those residents aged 21 or older, but in April 2019 it was lowered to 18. SB45 was introduced in the Kansas Senate in early 2015. The bill initially passed the Senate 31-7 on February 26. The bill was sent to the House, amended, and passed 85-39 on March 25. The Senate then concurred, passing the amended bill 31-8 (also on March 25). On April 2, the bill was signed by Governor Sam Brownback and the law became effective on July 1, 2015, establishing constitutional carry in Kansas. Kansas issues licenses to carry concealed handguns on a shall-issue basis. As of April 2015[update], over 87,000 current permits are issued. No permit is required to openly carry a firearm. Kansas will continue to issue permits so that Kansas residents may carry in other states that accept Kansas concealed carry permits. On February 14, 2019, the Kentucky Senate passed SB150 by a vote of 29-8. It then passed the Kentucky House of Representatives on March 1, 2019 by a vote of 60-37. On March 11, 2019, Governor Matt Bevin signed the bill into law and it takes effect in June 26 2019. It allows residents and nonresidents who are 21 years old or older who are otherwise able to lawfully possess a firearm, to carry concealed firearms without a permit. Open carry without a permit for both residents and non residents 18 years old or older was already legal as guaranteed by the State Constitution. In 2015, LD 652 was a constitutional carry bill that was under consideration by the Maine Legislature. It had 17 co-sponsors in the Senate and 79 co-sponsors in the House. LD 652 was signed into law by Governor Paul LePage on July 8, 2015. It came into effect on October 15, 2015 applying to both residents and non residents with no permit being required at 18+ for open carry and none required for concealed carry for 21+. In 2013, the Unlicensed Open Carry Bill was passed to clarify that no permit was needed to open carry at the age of 18+. As of July 1, 2015, the concealed carry law was amended to say "no license shall be required under this section for a loaded or unloaded pistol or revolver carried in a purse, handbag, satchel, other similar bag or briefcase or fully enclosed case". On April 15, 2016, the law was further expanded to include belt and shoulder holsters and sheaths. This effectively allows for constitutional carry in Mississippi for residents and non residents age 18 and up. However, some forms of concealed carrying would still require a permit (e.g. Mexican carry[Note 1] or concealed in an ankle holster). SB 656 allows for permitless concealed carry for anyone 18 years or older who may lawfully own a gun. The bill was passed by the legislature in 2016 but Governor Nixon vetoed it on June 27, 2016. The legislature reconvened for the veto-override session on September 14, 2016. The Senate voted to override the veto with a 24 – 6 vote (23 required) and the House followed through shortly thereafter with a 112 – 41 vote (109 required). No permit is needed for open carry or concealed carry for 18+ and applies to both residents and non residents. While no permit is required for either forms of carry, only concealed carry falls fully under state-preemption, thus unlicensed open carry can still be restricted by local city ordinances unless one possesses a concealed carry permit, thus exempting them from local open carry restrictions. The law went into effect on January 1, 2017. In early 2017, several senators and representatives introduced New Hampshire Senate Bill 12, which proposed removing the requirement for a license to carry a loaded concealed handgun. The bill also proposed extending the minimum license period from four years to five years, removing the discretionary "suitable person" language from the Pistol/Revolver License law, and directing the state police to pursue reciprocity agreements. On January 19, it was passed by the New Hampshire Senate by a vote of 13 – 10. Governor Chris Sununu, who took office in January 2017, expressed support for this bill after the Senate vote, stating, "I am pleased that the State Senate today voted to advance common sense legislation in support of a citizen’s fundamental right to carry a firearm, joining neighboring states throughout the region and across the country." On February 9, it was passed by the New Hampshire House by a vote of 200 – 97. Governor Sununu signed the bill into law on February 22, 2017. It took effect immediately. No permit is required for open carry or concealed carry and applies to both residents and non residents 18+. Previously, carrying a concealed handgun unloaded was legal without a license. A New Hampshire Supreme Court decision in 2013 clarified that the law did not prohibit carrying a concealed handgun if it is unloaded and no round is chambered, even if a loaded magazine is nearby. On March 23, 2017, North Dakota Governor Doug Burgum signed House Bill 1169. Under its provisions, people carrying concealed without a concealed weapons license will need to carry a form of state-issued photo ID, must a North Dakota resident for at least 1 year, must have had a state issue ID for 1 year, must inform police about their handgun upon contact, and must not otherwise be prohibited from possessing a firearm by law. Open carry of a loaded handgun will still require a permit, but no permit is required to open carry an unloaded handgun one hour before sunrise until one hour after sunset; one is allowed to possess a loaded magazine as long as it is not inserted into the gun. Carrying in a vehicle was originally thought of as requiring a permit but Attorney General Wayne Stenehjem issued an opinion interpreting the law as allowing for constitutional carry within vehicles. Non-residents will continue to be required to have a permit recognized by North Dakota to carry openly or concealed. The law went into effect on August 1, 2017. On February 27, 2019, Oklahoma Governor Kevin Stitt signed House Bill 2597, which will allow residents and non residents 21+ or 18+ and in the military to openly or concealed carry without a permit. It will go into effect Nov. 1, 2019. Oklahoma's existing reciprocity also recognizes any concealed carry license issued both as resident and non resident as well as the permitless carry of other states, so if you are a non resident and 18+ and your state allows open carry or concealed carry without a permit you may carry in that fashion so long as you have valid ID proving you're a resident of that state. On January 22, 2019, the South Dakota Senate passed Senate Bill 47 by a vote of 23-11. It then passed the House of Representatives on January 29, 2019 by a vote of 47-23. Governor Kristi Noem signed the bill on January 31. It takes effect July 1, 2019. No permit required to open carry or concealed carry for residents and non residents 18+. For many decades, the only state to allow "constitutional carry" of a handgun (i.e. without any government permit) was Vermont. From the formation of the 13 original states, "constitutional carry" was the law in all states until the 19th century. By the 20th century, all states except Vermont had enacted concealed carry bans, with the exemption in most states for those citizens with a permit. Due to wording in its state constitution and decisions made by the state courts, Vermont has never been able to have a restriction on the method of how one could carry a firearm, and thus, in this regard, Vermont stood entirely separate from the rest of the United States for quite some time. No permit is required (or offered) for open carry and concealed carry and this applies to both residents and non residents 18+ who can legally own a firearm. Because of this, constitutional carry is still sometimes referred to as "Vermont carry". HB 4145 was passed by the House on February 8, 2016 and Senate on February 22, 2016, but vetoed by Governor Tomblin on March 3, 2016. The House then voted to override the veto on March 4, 2016 and the Senate voted to override on March 5, 2016. The law took effect on May 24, 2016. No permit is needed to open carry for residents and non residents 18+ and for concealed carry for residents and non residents 21+. Residents and non residents may carry concealed if between 18-21 with a permit. On March 2, 2011, Wyoming governor Matt Mead signed legislation to allow constitutional carry. The law officially went into effect on July 1, 2011. Under the law, residents age 21 and older may carry concealed or openly without a permit. Visitors to the state and Wyoming citizens under 21 must have a valid concealed carry permit from a jurisdiction that Wyoming recognizes if they wish to carry concealed, or can open carry without a permit. While Wyoming does have the resident limitation it is similar to Vermont in that the police may not disarm a citizen just because they "feel" it's necessary. Some states have a limited form of permitless carry, restricted based on one or more of the following: a person's location, the loaded/unloaded state of the firearm, or the specific persons who may carry without a permit. As of February 28, 2019[update], these states are Illinois, Montana, and New Mexico. 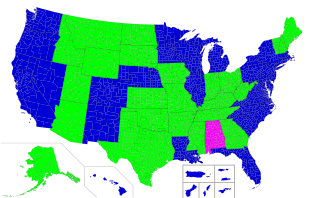 States that do not require a permit to carry only in very limited areas, e.g. at a person's home and/or place of employment, are not included in this section. Additionally, states that allow permitless carry or possession of firearms in vehicles are also excluded. In 1996, the Fourth District Illinois Appellate Court ruled that an unloaded handgun carried in a purse did not meet the definition of unlawful use of a weapon per se due to being fully enclosed. Following this ruling a movement started in the early 2000s dubbed Fanny Pack Carry, where proponents carried unloaded handguns in fanny packs to protest the state's outright ban on carrying loaded firearms. This resulted in several arrests but ultimately every criminal prosecution failed and resulted in one successful wrongful arrest lawsuit. In 2009 the Supreme Court of Illinois ruled that any object that fully encloses a handgun and fastens closed in any form or manner legally constitutes a "case" per se under Illinois Law. Possessed in conjunction with an Illinois FOID. The Illinois State Police reaffirmed this in a 2012 brochure that states that a person may have a firearm upon their person as long as it's unloaded and enclosed in a case. Montana introduced a bill early in 2011 to allow constitutional carry. The bill passed the House with a vote of 55-45, and passed the Senate with a vote of 29-21. Montana HB 271 was vetoed by Governor Brian Schweitzer on May 10, 2011 and was unable to gather the necessary two-thirds majority to overturn the veto. HB 298 was introduced in the 2015 legislative session, which would have legalized firearms carry statewide for all persons who are not prohibited from possessing a firearm. The bill passed the House 56-43 and the Senate 28-21, but was later vetoed by Governor Steve Bullock. Montana is currently a shall-issue state for concealed weapon permits and open carry is legal without a permit. In addition to Montana's concealed weapons permit system, state law provides an exception for the prohibition of concealed carry for "a person who is outside the official boundaries of a city or town or the confines of a logging, lumbering, mining, or railroad camp or who is lawfully engaged in hunting, fishing, trapping, camping, hiking, backpacking, farming, ranching, or other outdoor activity in which weapons are often carried for recreation or protection." Under New Mexico law, a concealed handgun license is required for concealed carry when the weapon is both loaded and concealed and the individual carrying is on foot. It is perfectly legal to carry ammunition as well as a loaded magazine so long as it is not inserted into the weapon. In 2013, John Mathis introduced a constitutional carry bill, HB76, into the Utah House of Representatives. It was passed by a two thirds majority in both the state House and the state Senate, but Republican governor Gary Herbert subsequently vetoed the bill, stating that the existing gun laws did not restrict one's ability to acquire a concealed carry permit, and "we're not the wild and woolly west". Utah law already permits civilians to carry a firearm openly without a permit as long as it is two actions from being fired,[Note 2] but open carry one action from being fired and concealed carry still require a permit. ^ e.g. 1) rack the slide to chamber, and 2) pull the trigger; or must carry with no bullet in the next chamber in a revolver, so have to pull the trigger twice to fire. ^ "Kansas: Permitless Carry Bill to Receive Vote Tomorrow on Senate Floor". NRA-ILA. 25 February 2015. Retrieved 27 February 2015. ^ a b c "Maine lawmaker submits 'Constitutional Carry' bill". Bangor Daily News. 26 February 2015. Retrieved 27 February 2015. ^ Associated Press (16 April 2010). "Arizona to allow concealed weapons without permit". Fox News. Retrieved 27 February 2015. ^ Gehrke, Robert (24 February 2011). "'Constitutional Carry' law stalls in committee". The Salt Lake Tribune. Retrieved 27 February 2015. ^ NRA-ILA. "NRA Advisory Notice Concerning North Dakota Permitless Carry Law". Retrieved 5 August 2017. ^ Louisiana Law Review (1 April 2010). "District of Columbia v. Heller: The Second Amendment Shoots One Down". ^ Congressional Research Service (7 September 2016). "Post-Heller Second Amendment Jurisprudence" (PDF). ^ "Judge's ruling threatens upheaval of Puerto Rico gun laws". Guns.com. Retrieved 2016-03-28. ^ "SAF LAUDS PUERTO RICO COURT VICTORY FOR GUN RIGHTS". Second Amendment Foundation. Retrieved 2016-03-28. ^ "Tribunal Supremo reitera constitucionalidad de la Ley de Armas". Departamento de Justicia de Puerto Rico. 1 November 2016. Retrieved 19 January 2017. ^ a b "Bill History Action for 23rd Legislature (Bill HB 102)". The Alaska State Legislature. Retrieved 12 March 2015. ^ "HB0102Z (Enrolled HB 102)" (PDF). The Alaska State Legislature. Retrieved 12 March 2015. ^ Rau, Alia Beard (16 April 2010). "Arizona to allow concealed weapons without permit". The Arizona Republic. Retrieved 12 March 2015. ^ Sakal, Mike (23 July 2010). "Concealed weapons permit, training requirement ends Thursday". East Valley Tribune. Retrieved 12 March 2015. ^ Paul Davenport; Jonathan Cooper (16 June 2010). "Arizona Gun Law: Concealed Weapons Allowed Without Permit Under New Law". Huffington Post. Retrieved 12 March 2015. ^ a b "Act 746" (PDF). ^ "Jamie Taff v. State of Arkansas" (PDF). ^ "SB 45". Kansas Legislature. Retrieved 8 April 2015. ^ a b Lowry, Bryan (2 April 2015). "Brownback signs bill that allows permit-free concealed carry of guns in Kansas". Kansas City Star. Retrieved 8 April 2015. ^ "Kansas Passes Constitutional Carry". ^ "Kansas Personal and Family Protection Act K.S.A. 75-7c01 et seq" (PDF). Kansas Attorney General. January 2015. Retrieved 5 March 2015. ^ "Gov. Bevin signs permitless conceal carry bill into law". ^ "Maine: "Constitutional Carry" Introduced in the Pinetree State". NRA-ILA Institute for Legislative Action. NRA-ILA. 27 February 2015. Retrieved 3 March 2015. ^ "Maine Governor LePage signs NRA-backed bill for Permitless carry". NRA-ILA Institute for Legislative Action. NRA-ILA. July 8, 2015. Retrieved July 8, 2015. ^ Staff, WLOX. "Gov. Bryant signs Church Protection Act". www.wdam.com. Retrieved 2016-04-16. ^ NRA-ILA. "NRA-ILA | Missourians Celebrate a Win for Self-Defense Rights on Wednesday". Retrieved 2016-09-15. ^ "NH SB12 2017 Regular Session". LegiScan. Retrieved 22 February 2017. ^ "Bill Text NH SB12 2017 Regular Session Introduced". LegiScan. Retrieved 22 February 2017. ^ Solomon, Dave (19 January 2017). "Senate OKs 'concealed carry' without a permit for firearms". New Hampshire Union Leader. Retrieved 22 February 2017. ^ "Governor Chris Sununu Statement on State Senate Vote to Pass Constitutional Carry Legislation". Office of the Governor of New Hampshire. State of New Hampshire. 19 January 2017. Retrieved 19 January 2017. ^ Tuohy, Dan (9 February 2017). "House passes repeal of 'concealed carry' gun license law". New Hampshire Union Leader. Retrieved 9 February 2017. ^ "Gov. Sununu signs concealed carry bill into law". WMUR. 2017-02-22. Retrieved 2019-01-31. ^ Grossmith, Pat (7 August 2013). "Court tells Manchester police a 'loaded gun' must have bullets in it". New Hampshire Union Leader. Retrieved 3 September 2013. ^ NRA-ILA. "NRA-ILA | North Dakota: Ruling Issued Approving Constitutional Carry in Vehicles". NRA-ILA. Retrieved 2017-12-17. ^ "Burgum signs "constitutional carry" bill into law | North Dakota Office of the Governor". www.governor.nd.gov. Retrieved 2019-02-28. ^ World, Barbara Hoberock Tulsa. "'Constitutional carry' becomes first legislation signed into law by Gov. Kevin Stitt". Tulsa World. Retrieved 2019-02-28. ^ "Reciprocal Agreement Authority". www.oscn.net. Retrieved 2019-02-28. ^ "SDLRC - 2019 Senate Bill 47". sdlegislature.gov. Retrieved 2019-01-29. ^ KSFY. "Gov. Kristi Noem signs 'constitutional carry' bill into law". www.ksfy.com. Retrieved 2019-02-01. ^ Cooke, Charles (24 June 2014). "Vermont: Safe and Happy and Armed to the Teeth". National Review. National Review. Retrieved 3 March 2015. ^ "The Vermont Constitution". USConstitution.net. Retrieved 3 March 2015. ^ "West Virginia Concealed Carry". www.wvcdl.org. Retrieved 2019-02-28. ^ "Bill Status - Complete Bill History". www.legis.state.wv.us. Retrieved 2016-03-05. ^ NRA-ILA. "NRA-ILA | West Virginia: Legislature Overrides Tomblin's Veto of Permitless Carry Legislation". NRA-ILA. Retrieved 2016-03-05. ^ "Bill To Authorize Satellite Casinos Dies in West Virginia Senate Finance Committee". theintelligencer.net. Retrieved 2019-02-28. ^ "Wyoming House approves concealed carry bill". Laramie Boomerang. Retrieved 26 February 2011. ^ "Wyoming governor signs concealed gun bill". Casper Star-Tribune. Associated Press. 2 March 2011. Retrieved 3 March 2011. ^ "Transport Your Firearm Legally" (PDF). Illinois Department of Natural Resources. Retrieved April 22, 2018. ^ "Transport your Firearm Legally" (PDF). Illinois State Police PDF rehosted by illinoisconcealcarryllc.com. Sep 1, 2012. Retrieved April 22, 2018. ^ "Senate endorses looser concealed carry law". KULR-8. 27 March 2001. Archived from the original on 2011-04-02. Retrieved 29 March 2011. ^ "Montana Legislature Detailed Bill Information". Montana Legislative Branch. Retrieved 3 March 2015. ^ "House Bill No. 298" (PDF). Montana Legislative Branch. Retrieved 3 March 2015. ^ Inbody, Kristen (27 March 2015). "Gun bills meet no votes, vetos". Great Falls Tribune. Retrieved 8 April 2015. ^ "UPDATED: House Green Lights Concealed Carry Without Permit". Flathead Beacon. Retrieved 26 February 2011. ^ "45-8-317. Exceptions". Montana Code Annotated 2014. Montana Legislature. This page was last edited on 14 April 2019, at 20:30 (UTC).